Below you can get a flavour of the range of our programmes, season by season. You can also hear some examples of our singing on our HEAR US page. ​The scale and grandeur of J.S. Bach’s B Minor Mass almost certainly means it was never meant to be performed within a liturgical setting. It was Bach’s last great choral masterpiece, and was not performed in full until over 100 years after his death. We are delighted to be joined for this incredible work by the Cambridge Baroque Camerata in the Victorian Gothic splendour of St John’s College Chapel, Cambridge. ​All proceeds will go towards supporting our charity partner CPSL Mind, who provide support services in the Cambridge and Peterborough area, for people experiencing mental health challenges. On behalf of everyone at CPSL Mind, I would like to say a huge thank you for the second financial installment of £4,865 from the Big Sing 2019, making a grand total of £8,101.68!!! This is an amazing amount to have raised and we are simply overwhelmed by your support. your support really does help a lot. Many thanks again for choosing us as your charity. ​Our Christmas concerts feature two highly imaginative works of the 20th Century. Benjamin Britten’s classic A Ceremony of Carols is paired with a semi-staged performance of the lesser known one-act opera Amahl and the Night Visitors – the first ever written for television – by Gian Carlo Menotti. In his native Italy, the role of Santa Claus is taken by the Three Kings who bring gifts to the children. His childhood love of these characters is the basis for his inspiration, and the opera has become his best-known work. Duruflé’s Requiem will lead our commemoration of 100 years since the end of the First World War, with our first concert on the eve of the anniversary itself. The music is inspired by chants from the Gregorian Mass for the Dead, and plainsong provides the basis of the selection of other shorter works in the concert by composers from Rachmaninov to the contemporary British composer David Nunn. A celebration of England’s remarkable tradition of choral music. We begin in joyful style with the effervescence of Purcell’s I was Glad, written for the coronation of James II in 1685, and move on to explore well-known and less familiar repertoire of the 19th and 20th centuries. The concert culminates with three beautiful and innovative contemporary works, including the world première of Hilary Burgoyne’s Fantasia on an Anthem by Tallis, which was runner-up in our Composition Competition last season and includes an audience chorus. Why not take a break away from Cambridge’s crowded summer streets, full of tourists and shoppers, for some gentle mid-afternoon contemplation? This short concert will feature beautiful French choral music guaranteed to transport your mind miles away from the hustle and bustle outside. 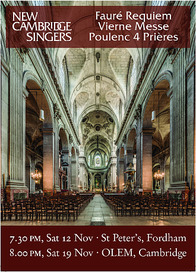 The programme will include Poulenc’s extraordinary Mass in G and motets by Duruflé and others. Passiontide has been fertile ground for composers through the ages. Alongside motets from the Renaissance and early 20th centuries, the concert will also feature two significant works, each very much of its time. Domenico Scarlatti’s Stabat Mater (1715) is a masterpiece of the choral repertoire, full of meditation and reflection, but also with drama provided by soloists emerging from the choir. In contrast, but equally powerfully, we will also be singing James Macmillan’s Cantos Sagrados (Sacred Songs, 1989), which combines sacred and secular texts highlighting political repression in South America. Our celebration of Christmas this year will include Poulenc’s hauntingly beautiful Quatre Motets pour le temps de Noel and Stanford’s exuberant double-choir Latin Magnificat, as well as popular and less well-known carols and Christmas music. The programme will also include the world première of Margaret Haley’s A Fisherman’s Baby, runner-up in our Composition Competition last season. For our first concert of the season, we find inspiration for our music from Russia, Hungary, Czechoslovakia and the United States. The centrepieces of our concert are Kodaly’s expressive Missa Brevis and Copland’s scintillating setting of the opening of the book of Genesis, and these are offered alongside two contrasting settings of the Lord’s Prayer: one by Janáček, for choir, organ and harp, and a real jewel of a version by the Russian conductor-composer Nikolai Golovanov. Rachmaninov transforms the plainchant melodies of the Orthodox Church into an incredible symphony of choral writing, offering staggering textural intricacy and emotional power, showing a composition genius at the height of his powers. The evocative chant-link melodies and legendary low bass writing are bound to be all the more atmospheric in the beautiful surroundings of a candlelit St Martin’s. In partnership with the Brandenburg Choral Festival of London. The soaring melodies and gorgeous harmonies of Rachmaninov’s Cello Sonata come from the same rich vein as his incredibly popular Second Piano Concerto, whilst the Vespers show a compositional genius at the height of his powers. In these fifteen short movements he transforms the plainchant melodies of the Orthodox Church into an incredible symphony of choral writing, offering staggering textural intricacy and emotional power. A programme ranging over five centuries of choral music, sung here by different combinations of voices, viols and Renaissance brass instruments. The centrepiece of the concert is Giles Swayne’s Everybloom; taking words from Joyce’s Ulysses, this work is written for choir, soloists and a consort of viols. The programme will also include Tallis' amazing 40-part motet Spem in alium and works by two other Renaissance masters: William Byrd and Orlande de Lassus..
To give you, the audience, a closer insight into all of this, you will have the chance to take part in two very different works: Tallis’ famous canon Glory to thee, my God, this night, and a new work for which NCS has held an open competition. Information about the competition and the winner is available here. The audience will be joining the choir for a rehearsal in the afternoon. If you are a singer with some choral experience, we would be delighted to welcome you to join us in our performances. Messiah remains justifiably the most popular English choral work, ranging in mood from the poignant Behold the Lamb of God to the roof raising Hallelujah. If you’ve sung it before you’ll know how wonderful it is to be involved in Messiah; if not, then this is the ideal opportunity to perform it for the first time. The performance will be with full orchestra and a team of soloists from New Cambridge Singers. Book early to avoid disappointment. We will provide vocal scores if you need one, but please bring a copy of Watkins Shaw edition if you have it. Many of our cherished Christmas traditions began in Victorian times, so get in the mood and join us for our festive performance of music from the Victorian era, atmospherically lit by candles around the church. There will be some carols for all the audience to join in. Exploring the beautiful tradition of French choral music, this programme contrasts the sumptuous harmonies of Poulenc’s exquisite a cappella motets for men’s voices with the imposing grandeur of Vierne’s only Mass setting and the intimate intensity of Fauré’s ever-popular Requiem. "The New Cambridge Singers absolutely slayed it yesterday evening! The Missa Solemnis by Vierne was amazing and gave me shivers." "The concert was lovely – the Poulenc was new to us, and very impressive, and the Faure was magnificent – it’s the first time I’ve heard it with the organ rather than an orchestra. The singing was brilliant. Thanks for a great evening – we came away feeling positively uplifted!" Choral favourites from across the centuries are presented in a smorgasbord of popular classics for choir. Mendelssohn’s justly famous O for the Wings of a Dove and Parry’s majestic setting of I was Glad – sung at the Royal wedding in 2011, as well as every coronation since 1902 – provide a contrast with madrigals and partsongs from early to modern times. The concert will conclude with choral arrangements of popular songs from the twenties and thirties by Cole Porter and friends. A wonderful evening of classical masterpieces - the exuberance of Mozart’s Figaro Overture and the tragedy of his Requiem are set alongside the lyrical eloquence of one of the greatest of the Romantic violin concertos. The pomp and bombast of Elgar’s Give unto the Lord and Stanford’s For Lo, I raise up contrast with the hauntingly beautiful This Worldes Joie by Arnold Bax and the effervescent The Twelve by William Walton. Howells’ posthumously published Requiem and Britten’s A Hymn to St Cecelia complete this survey of British music from the first half of the 20 th century. Christmas Elizabethan-style, with works by Gibbons, Tallis and Byrd contrasting with familiar melodies from Piae Cantiones , a volume first published during Elizabeth’s reign but rediscovered much more recently. Festive refreshments will complement what promises to be an entertaining and informative evening. New Cambridge Singers begins its new season with an exploration of music for choir and piano for two and four hands. Interesting and unusual works by Schubert and Britten are presented alongside the ever-popular Liebeslieder Waltzes and Faure’s Madrigal. The choir is joined by Maurice and Thanea Hodges, who as well as accompanying the choir will perform two intriguing works for piano duet. New Cambridge Singers and East Anglia Chamber Orchestra join forces for the first time in a performance of Haydn’s thrilling Nelson Mass and Duruflé’s achingly beautiful Requiem. Soloists Helen-Jane Howells, Lynette Alcántara, Stefan Kennedy and Alex Ashworth will join the choir and orchestra on stage in what promises to be an exhilarating and memorable concert. A programme of exquisite music for double choir. Two of Bach’s motets, the joyful Singet dem Herrn and the yearning Komm, Jesu, Komm, are contrasted with two classics by Sir William Harris: Faire is the Heaven and Bring us, O Lord. Contrasting mass settings by Lassus and the 20th-century Swiss composer Frank Marin complete the programme. This hour-long afternoon concert presents a selection of celebratory music in a wide variety of styles. Finzi’s well-known God is Gone Up and The Heavens are Telling from Haydn’s Creation are performed alongside Ascensiontide motets by Byrd and works by Handel, Monteverdi, Bach and Vaughan Williams. A panorama of festive music from Mediaeval to the present. We begin with works by anonymous 14th-century composers; move through Byrd to Bach, Schutz an beyond to Bruckner and Berlioz; and conclude with an exploration of 20th -century Christmas music from Europe and the USA. The Psalms of David have provided inspiration to musicians and composers across the centuries. In this programme, NCS explores settings of psalms both joyful and sorrowful, by composers as diverse as Byrd, Schutz, Allegri and Mendelssohn. Two settings of Psalm 90, by Vaughan Williams and Ives, open and close the concert. One of the first events to be held in Histon’s new community centre – this concert features Allegri’s Miserere, Mendelssohn’s Hear my Prayer, and other deservedly favourite works by Bach, Byrd, Finzi, Gibbons, Harris, Rachmaninov and Stanford. Sacred music by Byrd, Stanford and Howells as well as secular music by McCabe, Finzi and a few Colombian songs! An hour long concert of music by Byrd and Rachmaninov. A programme of French masterpieces including Duruflé’s Requiem, Langlais’ Messe Solenelle, Poulenc’s Litanies a la Vierge Noire and Messiaen’s O Sacrum Convivium.